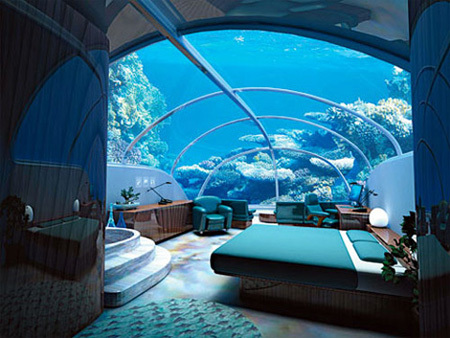 Is there anything more sensational than a hotel under the sea? It’s the opportunity to see ocean creatures in their natural habitat, the thrill of going to sleep surrounded by water and the overall impression that you are witnessing a part of the world that is usually shrouded in mystery that make underwater hotels so amazing and keep fascinated guests coming back. Underwater tourism is becoming very popular, especially because cutting edge submarine technology is making it possible to submerge entire five-star outfits under the waves. In Dubai construction is starting on the Water Discus, a hotel with guest rooms 30 feet below the surface, which can be raised should there be a need to evacuate or repair and can be towed to another location if Dubai turns out to be a poor choice. An entire resort has been planned for construction in Fiji. The first of its kind, the Poseidon will offer guests a weeklong escape during which they spend a few nights in each type of room (underwater, on-the-water, beach front – with a personal butler to move you, of course) and mini submarine lessons. The first undersea accommodation ever built was Jules Undersea Lodge off the coast of Puerto Rico, which opened to visitors in 1986. The former research station now offers a 20,000 Leagues Under the Sea-themed stay, complete with old school interiors, and lots of opportunities for diving (very important since the hotel entrance is 21 feet underwater). Large windows offer unobstructed views of the sea life. For a completely different underwater accommodation, may I suggest Sweden’s Utter Inn? One suite is available in the middle of a lake just outside of Stockholm, designed by a local artist and sculptor. The hotel resembles a very small traditional clapboard house, painted red and floating like a buoy one kilometre from the shore. Inside, guests must descend three metres to the tiny guestroom where windows allow fish to look in on the occupants. You can have dinner delivered for an extra charge, but mostly guests are an island unto themselves! One of the more fantastical underwater projects that is set to come out of the Persian Gulf was Hydropolis – a $550 million luxury resort built on the ocean floor, an astounding (and terrifying) 66 feet below the surface. The bubble shaped guest rooms and facilities, all encased in glass, would have covered 270 acres of underwater real estate, but the project was never completed.